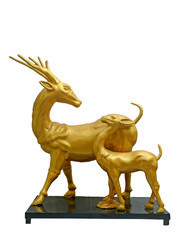 Our product range includes a wide range of golden deer pair. A gorgeous Life Size Deer Statue from our Life Size Animals Collection. Beautiful and very realistic. This gorgeous beauty is part of a collection of hand-crafted memorabilia replicas. It is sure to be a perfect piece to add to any collection. The incredible details depicted on this Golden Deer pair Statue truly make it museum quality. It is sure to attract crowd's attention and will make a wonderful conversation piece. This golden deer statue is made from durable materials using a cast resin mold mixed with fiberglass. It is then hand painted to the highest detail by professional artisans.Suitable for indoor or outdoor displays. (If displaying outdoors, we recommend applying a thin coating of polyurethane as needed to protect from weathering. Looking for Golden Deer Pair ?